MARCUS AURELIUS AE sestertius. M ANTONINVS AVG TR P XXVII, laureate head right, slight drapery on left shoulder. Reverse - RESTITVTORI ITALIAE IMP VI COS III, Aurelius standing left holding sceptre and raising kneeling figure of Italia who holds a globe. Rare. RIC 1078, Cohen 538. 30mm, 21.4g. MARCUS AURELIUS AR silver denarius. Captive Armenia seated below standard & shield. 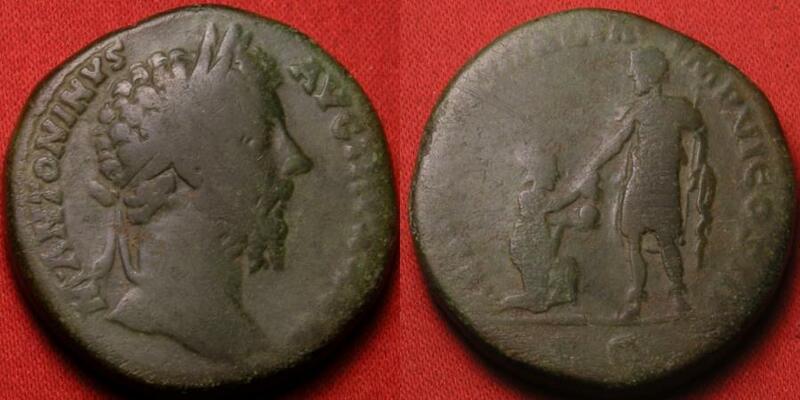 MARCUS AURELIUS AE as. River god Tiber reclining, hand on prow, water gushing forth from jug. MARCUS AURELIUS AE sestertius. Annona standing, modius at her feet.